Family holidays on Barbados go together like swaying palms and white sand beaches, and if you're looking for a spot of luxury amongst some of the finest screen saver scenery that the Caribbean has to offer then why not dive in as the water's never short of spectacular. Adding all-inclusive into a family hotel in Barbados alleviates untold pre-departure worries when it comes to budgets and good times with several resorts offering exchange programmes with sister hotels to help you maximise your time and find a pace that suits you and your family. 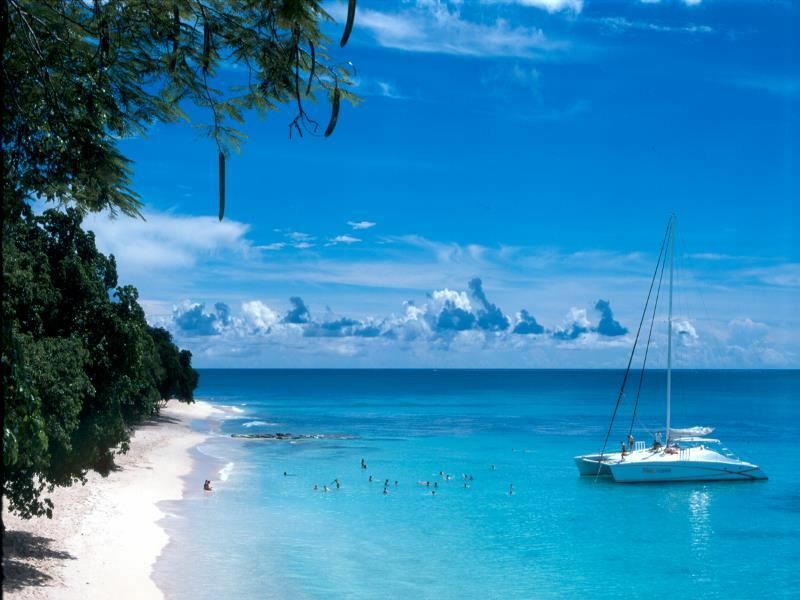 From Bridgetown and plantation properties to golf courses, watersports and those all-important sunset strolls along the shore, Barbados is an absolutely charming island and guaranteed to put a smile on your face as wide as the pineapple adorning your totally tropical glass of rum punch. What: Kick back and relax on the south coast of Barbados as you soak up some sunshine and enjoy the peace and tranquillity of the Caribbean. Bougainvillea Barbados is all about the beach, Maxwell Beach, and if you're intending to capture your moment against white sands, blue skies and emerald green palm fronds then right here is where you get clicking. Loads of fitness facilities, spa luxuries and watersports aplenty ensure everyone gets a work out at their own pace with a choice of dining and cocktail venues for once you've worked up an appetite or thirst. Best for kids: Indoor and outdoor play, sports and activity equipment allows parents to find some 'me time' whilst safe in the knowledge that their little pirates haven't been left all at sea. Complimentary snorkels, kayaks and boogie boards are also on hand ocean o'clock as well as three swimming pools to keep them sun kissed and splashing from dawn till dusk. Best for parents: The history and heritage of Barbados is as fascinating as any well thumbed paperback and trips into Bridgetown, George Washington House or the Barbados Museum will help you find out more. If roots & rhythm is your thing then the dinner show will no doubt get you swaying in the right groove with golf courses, horse racing and boutique shopping offering a little something extra during the day. The Bougainvillea's restaurants, Lanterns and Water's Edge, offer a blend of Caribbean comfort and Italian familiarity with a cosy cocktail bar providing the place to be once the sun sets on yet another gorgeous day in beautiful Barbados. What: Just moments away from the ever popular St Lawrence Gap, The Sands Barbados offers an authentic insight into the Bajan lifestyle, mixed beautifully with bright white, contemporary interiors. Nestled on a pristine white sand beach, this gorgeous resort boasts a beautiful freshwater pool, fantastic non-motorised water sports, delicious cuisine, and live music in the evenings. 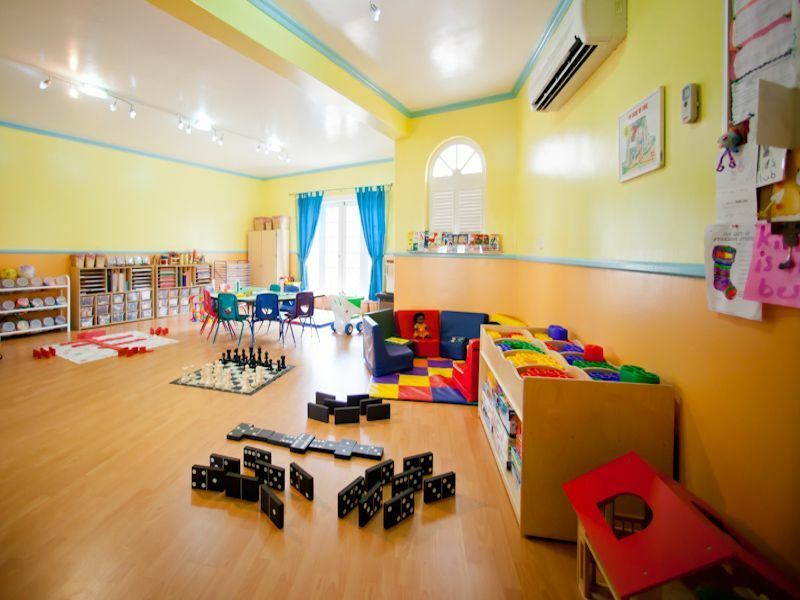 Best for kids: The kid's club (for children aged 3-12 years old) offers a myriad of brilliant activities that will keep any young explorer entertained and excited. From the fun play area with swings, to sports including tennis and basketball, the kids will certainly be conked out after a day of fun in the sun. The Family Suites are ideal for young families too - with such close proximity to the pool, the kids can start splashing around as soon as they wish. Best for parents: Sipping on a refreshing cocktail right by the sparkling freshwater pool, indulging in a treatment at the tranquil spa - mum and dad will be treated to many 'pinch me' moments whilst the kids play together. There's plenty of child-pleasing dishes at the main restaurant, but should you fancy a romantic dinner for two, the a la carte restaurant offers decadent cuisine and first-class service. 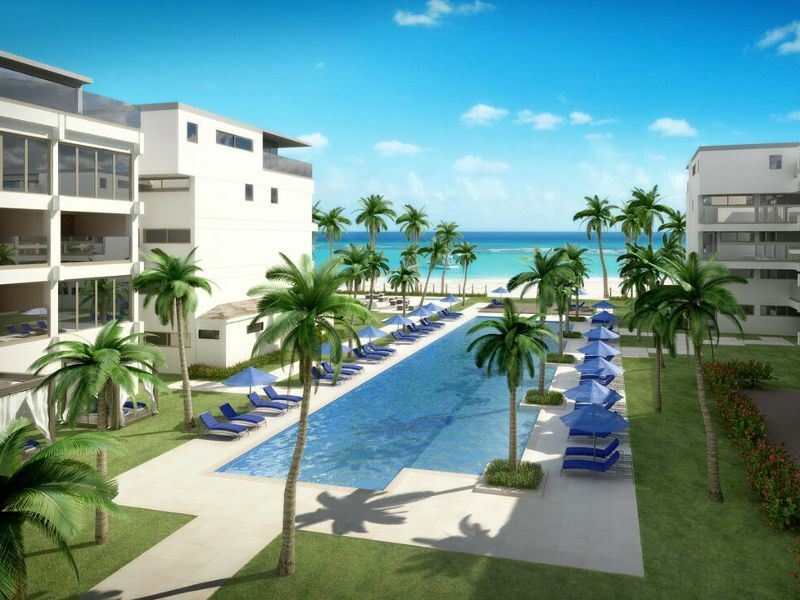 What: Why not give the west side of Barbados you're full attention as you indulge in a little luxury at the Tamarind. Set upon a crystal white sand crescent you'll find just over 100 guest rooms and suites providing the perfect combination of contemporary comforts and laid back Caribbean charm. Loads of things to do and a beach front setting, what more could you ask for? 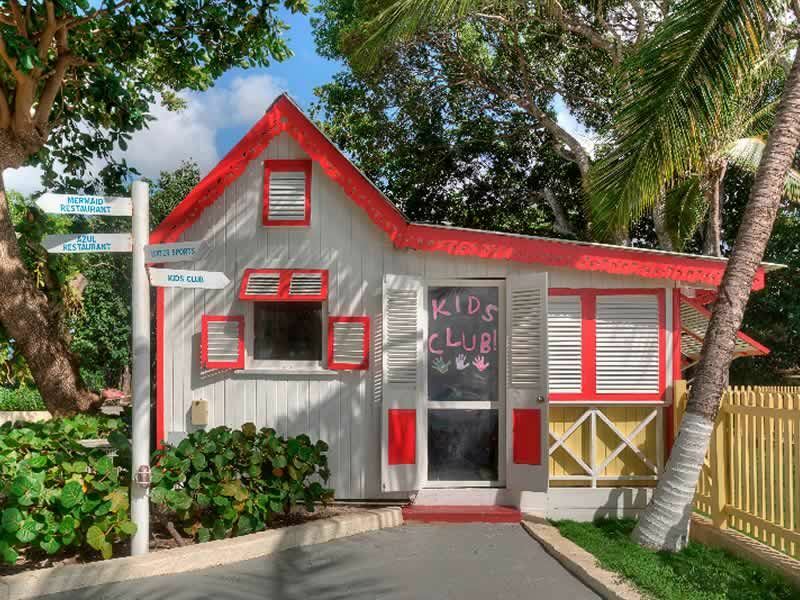 Best for kids: The awesome Flying Fish Kids' Club is perfect for 4 – 12 year olds during the day whilst movie nights, early suppers and a babysitting service allows for a little more leeway when it comes to organising a Caribbean holiday that everyone can enjoy. Three fab swimming pools, nearby caves and a local horse riding centre should keep them happy and active all day long. 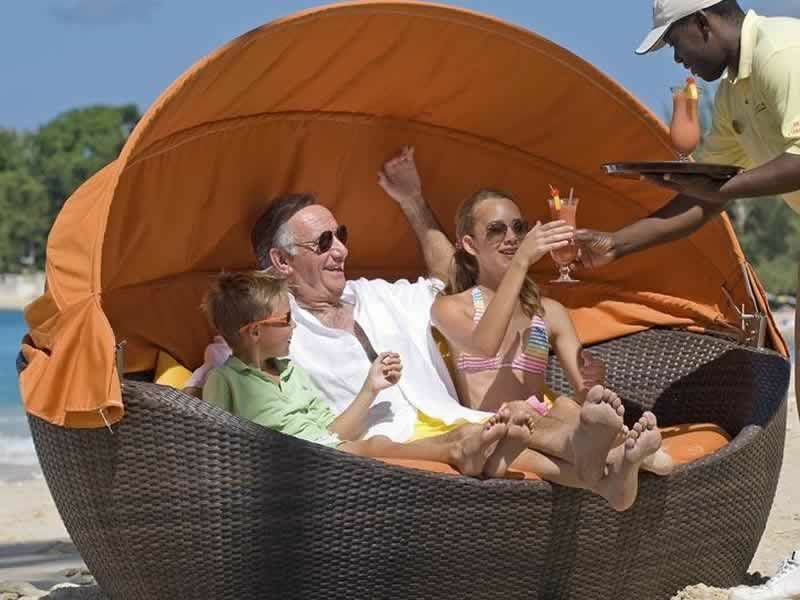 Best for parents: Take up the offer of flitting between the Tamarind and the Colony Club to increase dining options or just make the most of Rilaks Deck, the Sugar Cane Room or Daphne's Restaurant for the very best in Bajan, Italian and Miami style dishes. After a day at the gym, beauty salon or getting to know the basics of a few non-motorised watersports, why not watch the sun set at the 246 Bar & Restaurant or take a cruise along the coast? This is your holiday and if you want to watch the cricket, learn to dive or take a taxi over the ocean to find out what else Elegant Hotels have in store then why the heck not? What: Thanks to the fabulous location, right on the wonderful west coast, the Colony Club lets guests step back in time amongst the palm fronds and white sands that make Barbados such a classic experience. With fewer than 100 well-appointed rooms and suites this is the sort of property that calls out class and if you're looking to indulge in some well-deserved relaxation or take advantage of a full range of watersports equipment then jump in with both feet as the water's lovely. Best for kids: If your children are going to be more than satisfied flitting between four pools and the ocean waves then the Colony Club certainly won't let them down. There's a good choice of watersports and a couple of tennis courts as well as unique 'bait to plate' fishing trips to help over nines get to grips with hunter gathering, Barbados style. Best for parents: From board games and spa services to water taxis along the west coast, the Colony Club is all about reviving flagging spirits and sampling a taste of the good old days. Bridgetown and the local golf course are both easily accessible and if you tire of the Laguna Restaurant, Sunset Bar or Planters Bar then getting out to explore is a great way to discover new spots to park your suntanned self. What: If secluded and exclusive is what you're looking for from a break in Barbados then welcome to paradise as the Sea Breeze is situated on the sultry southern coast with access to two beaches as well as fab views over the bay. An adults only swimming pool, lounge bars and three Jacuzzis will help everyone have fun in the sun with an excellent choice of water sports and land based activities helping you get sun kissed and active in no time at all. 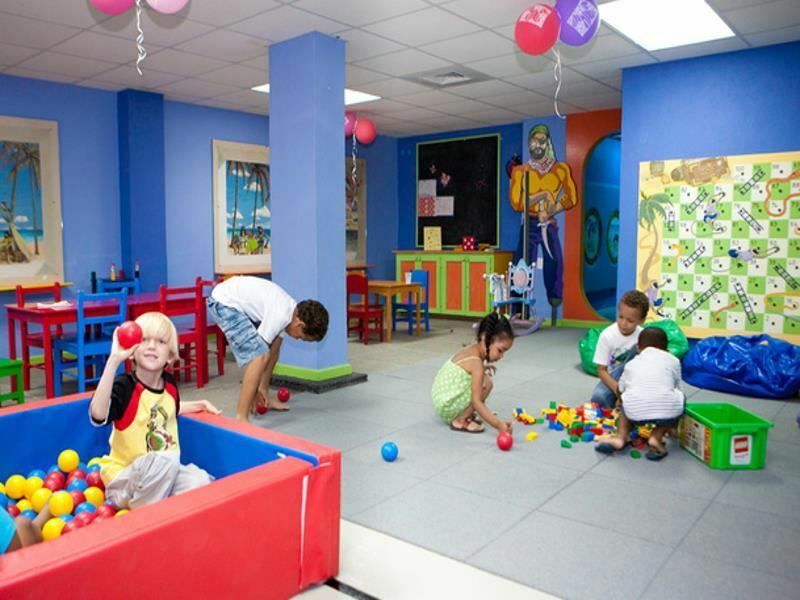 Best for kids: There's a great 'kids stay free' offer worth checking out as well as an indoor and outdoor kids' club in addition to a fully staffed babysitting service. Other than that there's just a swimming pool, a couple of beaches and an informal pizza/fish and chip restaurant – sound good? Best for parents: The Sea Breeze is all about the activities and you'll find volleyball, watersports, a gym and pool table to help you work up an appetite or work on your tan. A swim to lounge experience is strictly adults only and the Azul cliffside fine dining restaurant is certainly worth adding to an itinerary, so keep an eye out for opening times. What: Grab yourself some all-inclusive luxury in the Caribbean as you check into Crystal Cove and sign up for a whole heap of west coast wonderment in beautiful Barbados. 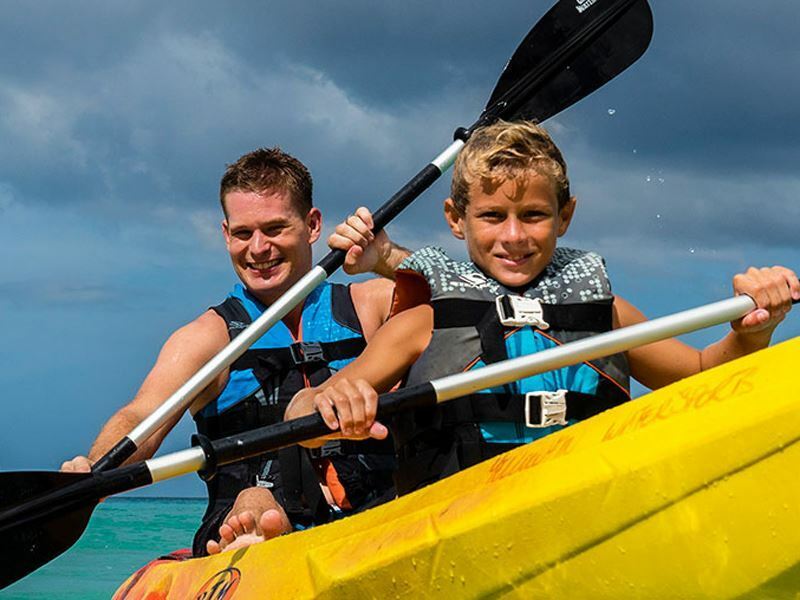 Loads of watersports and land based activities, including complimentary classes, make the 88 guest rooms and suites of Crystal Cove a real hidden gem and if you're looking for more things to do then the island's capital, Bridgetown, never fails to deliver. Best for kids: Aside from three multi-tiered swimming pools, nearby horse riding centre and the resort's proximity to the beach (closer than close) kids will be spoiled for choice at Crystal Cove with the fabulous Flying Fish Club for 3 – 12 year olds always coming up trumps for parents and pirates alike. Aqua School is also on hand to ensure everyone's ship shape and helps kids get to grips with a range of watersports within safe and secure conditions. Best for parents: A couple of flood-lit tennis courts, a fully-equipped fitness centre and a wide choice of complimentary watersports lets you enjoy the laid back Barbados life in style with preferred tee times at the local golf course helping you really get into the swing of things. A water taxi is always on hand to help you discover alternative resorts along the coast however, with Reflections Restaurant, Drifters Restaurant and the Cave Bar in-resort, you might be well advised to just stay local rather than going 'out out'. 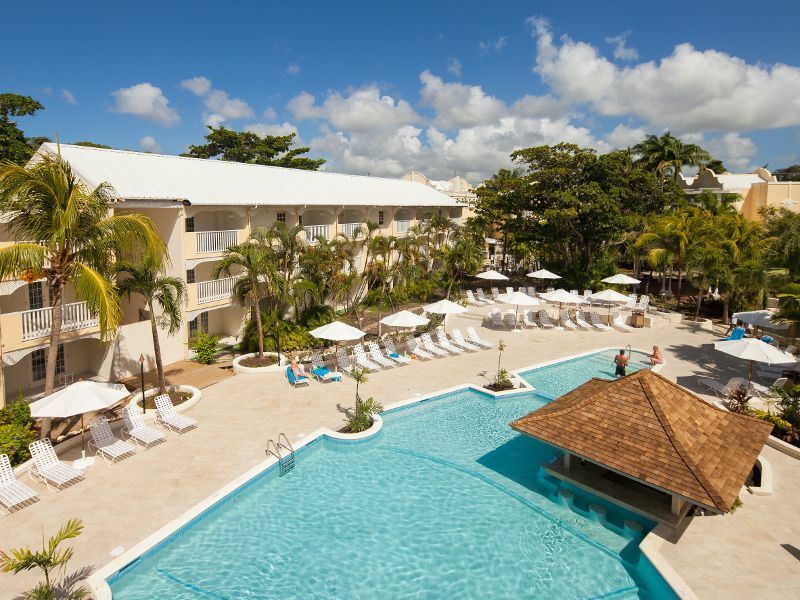 What: All-inclusive south coast luxury in Barbados has got winning stamped right through it and if you're wishing for a white sand setting juxtaposed against a clear blue sky and a totally tropical garden then Turtle Beach has got the lot and then some. With St Lawrence Gap just down the road this is the right resort to let your hair down with some amazing views from where to rest and relax after a night spent tasting the local rum punch – delicious! Best for kids: The Flying Fish Kids' Club never fails to get the thumbs up with both parents and children (3 – 12 years old) with a kids' pool, babysitting service and teens' area offering something for the whole gang to enjoy. Best for parents: Two swimming pools, a full compliment of non-motorised watersports and Scuba lessons in the pool let you really take advantage of the glorious Caribbean with a beauty salon on hand prior to an evening of live entertainment and dancing. A choice of three restaurants allows guests to sample local fare or stick with tried and tested Italian; although free exchanges with the nearby Crystal Cove resort opens up a world of alternatives from noon till night. What: Just 25 minutes from Bridgetown, under an hour from the airport and slap bang on the west coast of Barbados; if you're looking for a touch of all-inclusive elegance then check out Mango Bay for some of the tastiest temptations around. Just 75 guest rooms promise pure and simple splendour for anyone interested in making the most of the beach and the facilities with spa, watersports and evening entertainment offering an essential Caribbean experience to get you all excited. Best for kids: Mango Bay is situated on a beautiful stretch of beach with a couple of freshwater swimming pools for when the kids tire of all that crystal white sand and palm trees (as if). Please note, however, that Mango Bay does not offer a kids' club, so this hotel is ideal should you want to spend quality time with the whole family. Best for parents: From plantation properties and botanical gardens to historic Bridgetown and the awesome Atlantic, this is a great resort for adults looking to enjoy the finer things in life as well as plenty of laid back island luxury. With one glass bottomed boat ride included as well as chances to learn how to Scuba dive in the pool you'll find plenty of ways to see Barbados from underwater with barbecues, buffets and beachside dining offering all manner of means to make the most of your stay on land. What: Known for its focus on wellness, this elegant resort is ideal for those hoping for a more relaxing family holiday. Older kids will love the freedom of doing what they want as their parents indulge in spa treatments, coming together at meal times for deliciously fresh Mediterranean and Asian cuisine with a stunning ocean view. Best for kids: This is the place to be for water-loving kids and teens – hence the apt resort name. Younger kids will enjoy splashing in the family pool fit with pool ambassadors to top up their sun cream and keep them hydrated, whilst older children will enjoy learning how to paddle board and water ski whilst taking advantage of the complimentary water sports. Best for parents: If you’re booking a stay at Waves Hotel & Spa, odds are you love to relax with a revitalising spa treatment. If that’s the case, you’ll relish receiving up to four complimentary spa treatments (depending on your room category and length of stay). You deserve it. 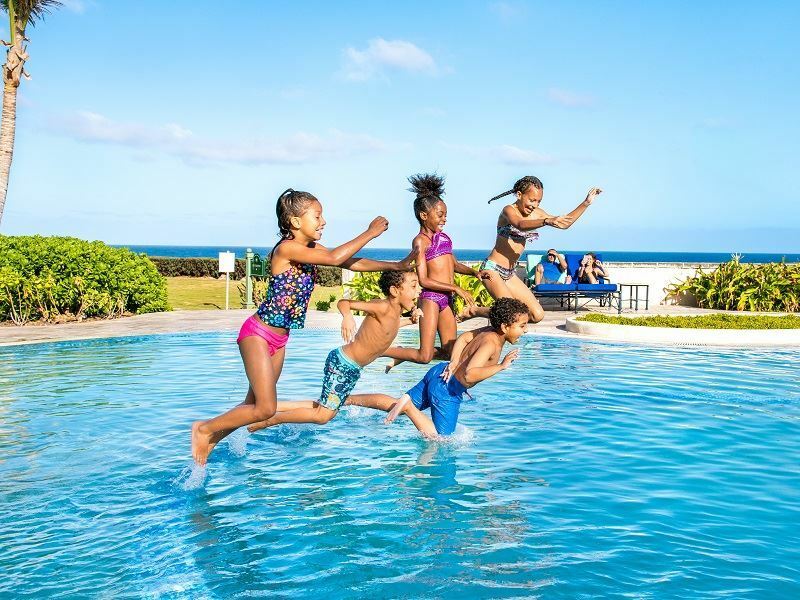 What: Brand new for 2015 and boasting some of the brightest and best all-inclusive family-friendly facilities on the southern stretch of Barbados. Loads to do for the whole brood with no fewer than five restaurants to choose from alongside 138 modern guest rooms all within ten minutes of Bridgetown and right on the beach. Best for kids: A kids' club, teens' club, crèche and babysitting service will strike the right chord with families and if you're looking for more then check out the two swimming pools and range of non-motorised watersports to keep kids and big kids happy and active all day long. Best for parents: The Sugar Bay swim up bar always puts a smile on the faces of guests with the spa, Jacuzzi and nearby fitness centre adding a few more. All-inclusive features include afternoon tea, unlimited drinks and the kids' clubs so all you have to do is kick back and recline as the sun sets or watch the evening entertainment after dinner at one of the resort's five separate restaurants.